These little pies are so tasty and really quick to make. Pre-rolled puff pastry is a great time saver; I always keep some in the freezer and use it to make fruit or vegetable pies as well as to top meat pies whenever I’m in a rush. Plums lend themselves very well to this kind of simple preparation as you can really taste their natural sweetness, plus you can enjoy their gorgeous appearance. I like to use several different varieties for contrasting colour and also to create a sweet-sour taste experience. These plums came from Niagara’s Warner’s Farm – we are so lucky to have them at the Ottawa Farmers’ Market since our area is not suitable for growing stone fruit. Peaches and nectarines work beautifully in this yummy dessert as well. Fresh fruit bakes up beautifully into little open faced tarts, called galettes. Lay out puff pastry sheet and cut into four large or six medium rectangles. Transfer each rectangle to a parchment-lined baking sheet. 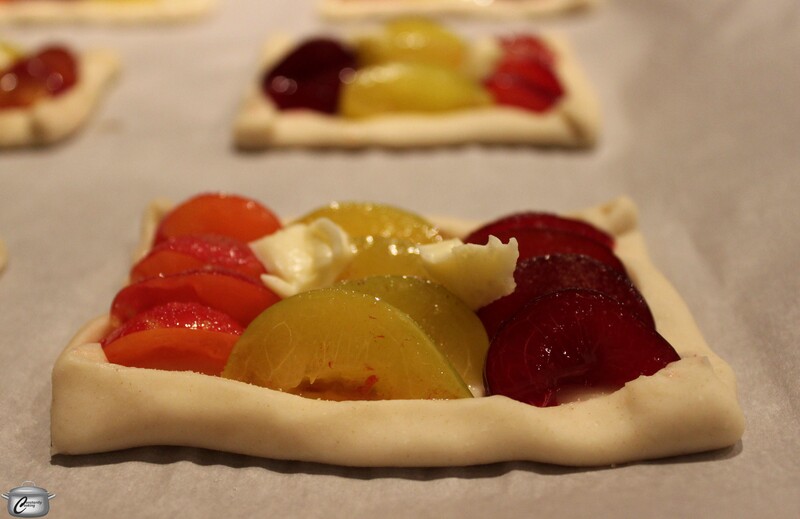 Gently fold up all four edges of each rectangle to create a small lip around the edge of each galette. This helps to hold the fruit juices in as the pastry puffs while it bakes. Cut the fruit into slices and arrange attractively on top of the pastry rectangles. Combine sugar and cinnamon and sprinkle over top of the fruit. Dot each pastry with butter. Galettes take just a few minutes to prepare and bake. While plums are lovely, peaches or nectarines would be equally delicious in this manner. Bake for 13 – 15 minutes until pastry is puffed and golden. Fruit should be tender but still hold its shape. Let cool for at least 5 minutes before serving either warm, or at room temperature. Makes 4 – 6 galettes. 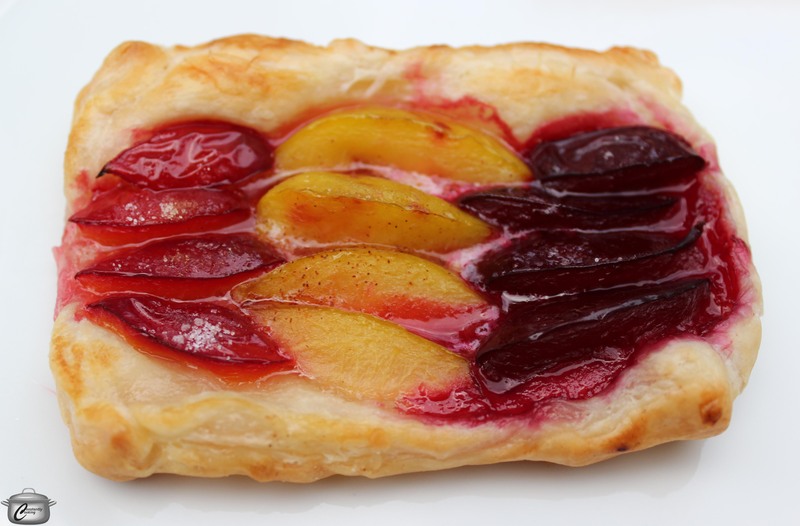 This entry was posted in Desserts and tagged butter, cinnamon, galette, nectarine, Ottawa Farmers' Market, pastry, peach, pie, plum, puff pastry, sugar, Warner's Farm. Bookmark the permalink.